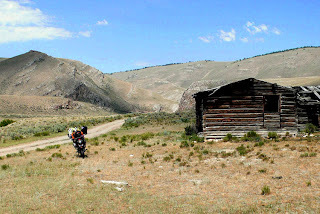 One of the backcountry routes I enjoy the most is the 19th-century road over Bannack Pass, in the Beaverhead Mountains along the Continental Divide between eastern Idaho and southwestern Montana. More than a century ago, the old Bannack road linked Montana's territorial capital, today's ghost town at Bannack State Park, with Corinne, Utah, not far from the Transcontinental Railroad. Today, it is a little-traveled single-lane dirt road that combines homestead-era log structures, inspiring northern Rocky Mountain scenery, a gear-soaking stream ford and easy access to a day-long loop. There are two ways to experience this corner of Big Sky country. One is an officially designated backcountry tour route. The other is from Idaho, where I live. 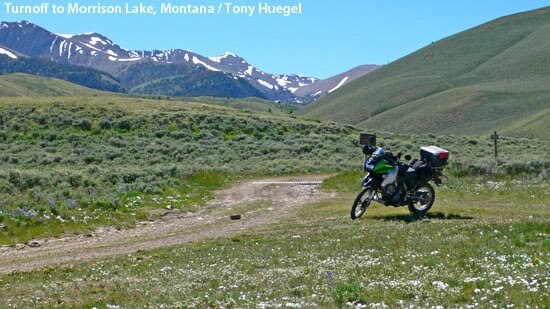 Montana's 50-mile, 3-hour Big Sheep Creek National Back Country Byway gives adventurous travelers a chance to experience the kind of impressive mountains-and-valleys scenery and sense of remoteness that only southwestern Montana can provide. Its north end is at Montana Highway 324 west of Clark Canyon Reservoir. It's southern end, where it follows Big Sheep Creek, is at I-15 near Dell. It is a beautiful backcountry tour, suitable to any high-clearance vehicle or dual-sport motorcycle, unless the road is wet, when it can become impassable. 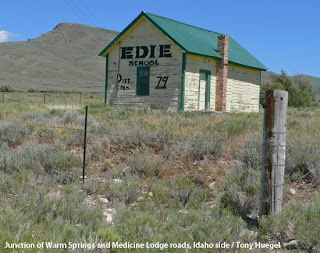 Since I live in the eastern-Idaho city of Idaho Falls, less than 80 miles south of the Montana line, I take I-15 north for 50 miles to the hamlet of Dubois (DOO-boyz). 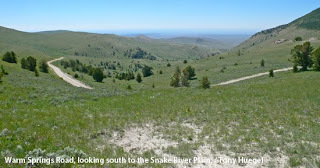 Dubois lies on the northeastern edge of the vast Snake River Plain south of Monida Pass, a gap between the Beaverhead and Centennial mountains. Together, these mountains form part the Continental Divide of the Americas, a.k.a. Great Divide, or simply Continental Divide. 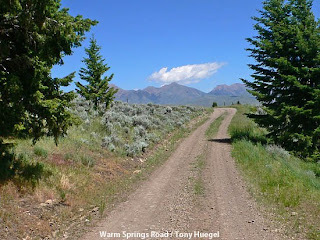 From Dubois, I take Idaho 22 west for about 18 miles, then turn north on dirt-and-gravel Warm Springs Road. A shorter but still rewarding option would be to take Idaho 22 west for about 5 miles west from Dubois, then turn north onto paved Medicine Lodge Road. Medicine Lodge Road passes historic Small Cemetery, a poignant reminder of the hardships that homesteaders faced long ago. Farther on, at the junction of Medicine Lodge and Warm Springs roads, is the old and affectionately maintained one-room Edie School. Unpaved Warm Springs Road (192) makes a serpentine climb from the volcanic Snake River Plain into the foothills of the Beaverhead Mountains, passing some primitive campsites and eventually connecting with Medicine Lodge Road. There is a point at a bend in the road where there are three ways to go. It's instinctual to go straight, on Warm Creek Road. But follow the bend to the left. Just beyond a fence, take the dirt road the ascends uphill to the right. The third branch, road 199, is a beautiful spur that continues west into the Beaverhead Mountains. It does connect with more primitive road 195, which links to Medicine Lodge Road farther north. Medicine Lodge Road becomes a small, primitive yet easy two-track road as it climbs toward Bannack Pass, which provided a broad vista into the valleys of southwestern Montana. 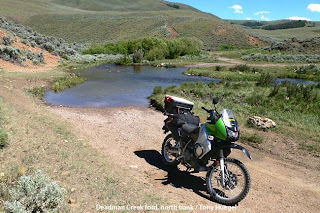 Soon the road brings you to the ford at Deadman Creek, which is best attempted after the snowmelt has receded, say by early July. It's a fun crossing, and you will get wet. It surprises me every time I cross, whether in my four-wheel-drive 4Runner or on my KLR 650. Beyond the ford you will pass a number of old log structures, the second of which is an old stagecoach station, a rancher whose family homesteaded this area told me. Eventually you will connect with Big Sheep Creek Road, which goes to I-15 and dirt Medicine Lodge Road. The continues north to Montana Highway 324. It's scenic and historic, certainly worth taking, but nasty or even impassable when wet. 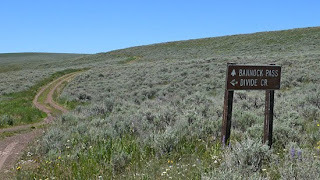 It is the official byway, marked by BLM Back Country Byway signs and easy to follow. Heading northwest, Medicine Lodge Road bends toward the mountains, and then makes its way north through an expansive landscape of rolling, forested foothills and rangelands. Where Medicine Lodge Road bends north, close to the base of the mountains, there is the signed turnoff for 4x4 route to beautiful Morrison Lake. This primitive road has a mud-and-water section that might be a challenge for big bikes. 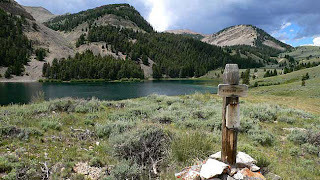 The lake, set at the base of the mountains, is a great place for primitive camping. Just be prepared for mosquitoes, and to be self-contained. There are no facilities. 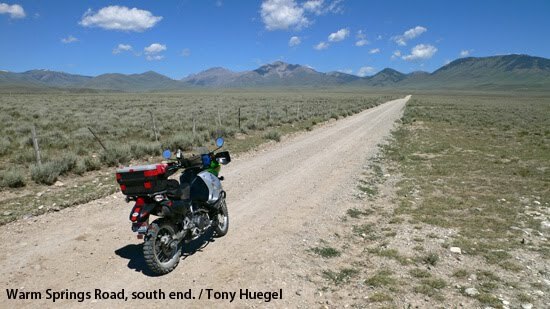 The long descent from the high country will bring you to the official byway's end, at Highway 324 not far from Clark Canyon Reservoir and I-15. Turn west here, onto Highway 324, and in a few miles turn north onto Bannack Bench Road. It will lead you to the state park at Bannack, an authentic Montana ghost town that is preserved in a state of stabilized deterioration. There is a woodsy campground, but again, bring bug repellant. As an aside, continuing west on 324 into the Beaverhead Mountains (part of the Bitterroot Range) will take you up to Lemhi Pass, where a party from the Lewis and Clark Expedition first crossed the Divide. 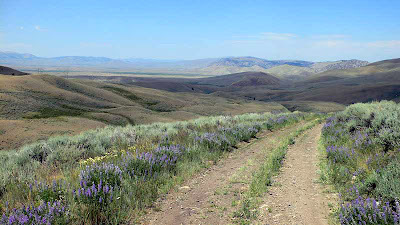 There, you can follow the Lewis and Clark Back Country Byway. Like your little blog. If you get a chance take the trail from Morrison Lake across the divide and come down Hildreth Creek.